Sharing designs with clients can be a big hassle for professional graphics designers. For example, let’s say you are designing a website and have to show the design screens to the clients remotely. In such cases, you can either create a slideshow, email all the design screens, or use other online sharing methods. In this article, I covered a simple web tool which is way more convenient than any other methods. Drafta is a free web tool to share web design screens online. The main advantage of this tool is that it allows you to create an organized structure just like a website menu. This way, you can easily share the design project organized in the proper structure which will be easy to navigate and understand for clients. So, let’s get started. With Drafta, you can create projects and add your designs in an organized structure. In the project, you get an index on left with a canvas covering the rest of the screen. From the index, clients can easily navigate through the project. Here, you can make a showcase of all the design screens arranged in the required structure. In a design project, you can create pages and folders to create a proper structure. 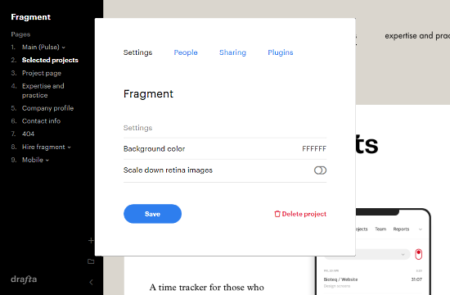 When you create a page, Drafta gives you two options on the canvas; one to add a text and another add an image. You can add any of those options to a page as per your needs. 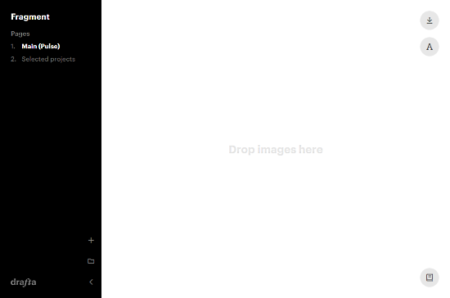 You can also add an image (JPEG or PNG) by simple drag and drop. 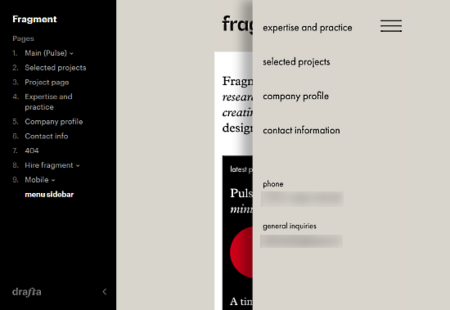 To keep the design project simple, Drafta only allows either one image or a text on a single page. Furthermore, you can create separate folders and add multiple pages under each folder. This way, you can easily organize all the menus and submenus. From the folder settings, you can make a folder private and hides it from the public URL making it exclusive to designer(s) only. Drafta also has online collaboration which allows you to invites other designers to add designs to the project. This comes handy for a design project where multiple designers are involved. Once the project is ready, you can make the project public from Project Settings and get a shareable URL to your project. Drafta also offers a Sketch plugin which allows you to add designs directly from the Sketch. A slack plugin is also on its way that will show notifications in project channels. You can try Drafta here. Drafta is a handy tool to easily share design screens organized in the desired structure. It’s an easy solution for designers to show their designs to the clients without too much effort. Try it yourself and share your thoughts with us in the comments.